The Middletown Insider: Xavier Falcons Take On Norwich Free Academy Tonight At 7pm! Xavier Falcons Take On Norwich Free Academy Tonight At 7pm! 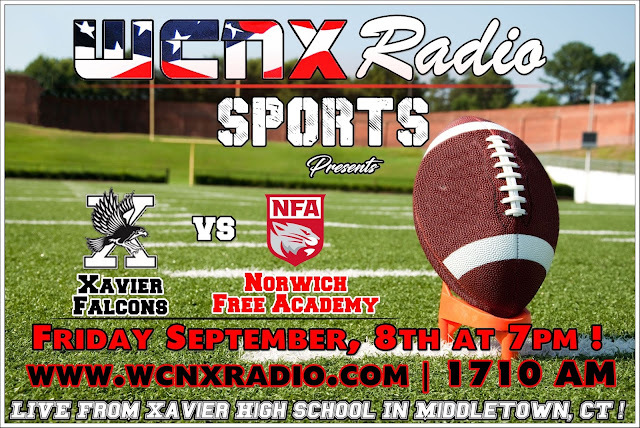 The Xavier Falcons take on the Norwich Free Academy Wildcats tonight at 7 pm at Xavier High School in Middletown. The game will be broadcast live on WCNX Radio in Middletown, at www.wcnxradio.com with Announcers Jay Hickey, and Jack Lutz. This is the first game of the season for WCNX, and we'll post the games they cover so you may support the student athletes from the comfort of your home!